Crystal Lake in Enfield NH is 401 acres with some great fishing. Listen to the loons and enjoy the beautiful sunsets from the terrace or deck overlooking your 70 ft of private Crystal Lake waterfront. With the new aluminum dock your boat will be within steps of your waterfront home. this solidly built 2 bedroom, 2 bathroom property provides the perfect spot for year round enjoyment of the pristine beauty of Crystal Lake. On those cold nights you might sit by cozy woodstove preparing for a day of ice fishing, skiing or a trip to Hanover. Listed by Coldwell Banker Redpath and Company. 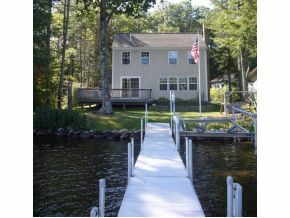 For additional information on this home call Lady of the Lake Realty at 1-888-737-5550 or e-mail at info@nhlakesrealty.com or visit our website to view similar lake homes in New Hampshire at www.nhlakesrealty.com or www.lakeorskirealestate.com Contact us today!